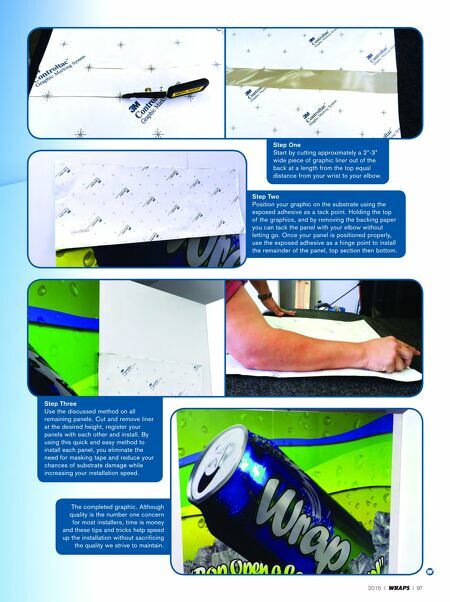 2015 I WRAPS I 97 Step One Start by cutting approximately a 2"-3" wide piece of graphic liner out of the back at a length from the top equal distance from your wrist to your elbow. Step Two Position your graphic on the substrate using the exposed adhesive as a tack point. Holding the top of the graphics, and by removing the backing paper you can tack the panel with your elbow without letting go. Once your panel is positioned properly, use the exposed adhesive as a hinge point to install the remainder of the panel, top section then bottom. Step Three Use the discussed method on all remaining panels. Cut and remove liner at the desired height, register your panels with each other and install. 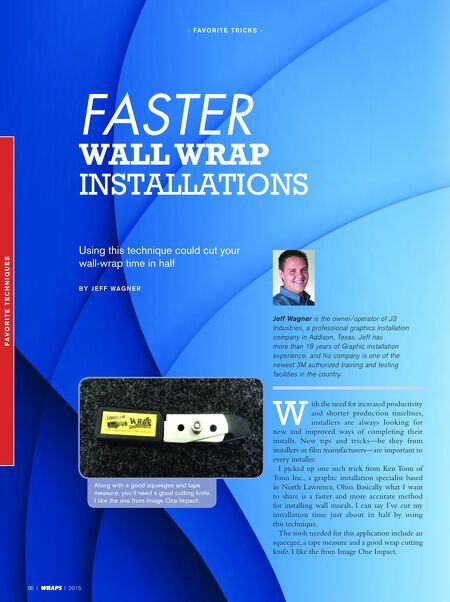 By using this quick and easy method to install each panel, you eliminate the need for masking tape and reduce your chances of substrate damage while increasing your installation speed. The completed graphic. Although quality is the number one concern for most installers, time is money and these tips and tricks help speed up the installation without sacrificing the quality we strive to maintain.